"...Director Jules Aaron keeps the story light and tight with spot-on timing and fine chemistry between the romantic leads. Though the production begins somewhat slowly, it picks up the pace and keeps the audience guessing." "...I personally love Agatha Christie, and the Group Rep at the Lonny Chapman Theatre has the rarely seen Christie play, "The Secret of Chimneys," a comedy spiked with a murder mystery, and directed by the incomparable Jules Aaron. And, it’s fun, fun, fun." "...The good news? 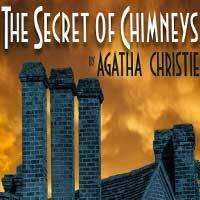 The Group Rep’s current production, Agatha Christie’s rarely done 1931 play, The Secret of Chimneys, is satisfying on all accounts. In terms of plot and characters, it doesn’t measure up to her greatest creations, such as Hercule Poirot and Murder on the Orient Express, or Miss Marple and Murder at the Vicarage, but it does quite well for an evening at the theatre, even though it is an unfashionable three-act play. Two ten-minute intermissions allow for a leg stretch, conversation with you seat mate, and phone games, which gets you out the door by10:30pm." "...The Secret of Chimneys has more twists and turns than a renegade tornado. Lord Caterham has been persuaded to host a party at his country estate Chimneys. In attendance a British politician and the presumed heir to the throne of Herzoslovakia and others. AS the party progresses eventually bon vivant Anthony Cade arrives and connects with Virginia Revel. Suddenly a gun shot rings out and Cade and Revel discover the body of the Herzoslovakia royal; now dead from the gun shot. Now the full force of renown writer Agatha Christie takes full effect."